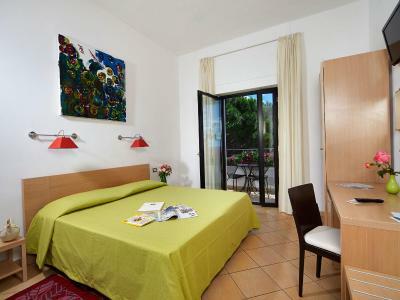 Lock in a great price for Hotel Cala Luna – rated 8.8 by recent guests! Very friendly hotel with lovely staff. It was kept exceptionally clean and was run efficiently. The restaurant was quite expensive although the food was ok. Very well situated for local beaches and the harbour.. 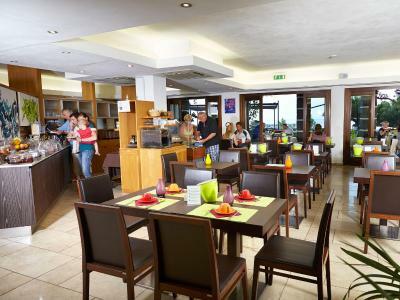 Very friendly staff, great breakfast, great location right in front of the sea and close to amazing beaches with the most crystal clear water. The location of the property is very good as it is right next to the beach. 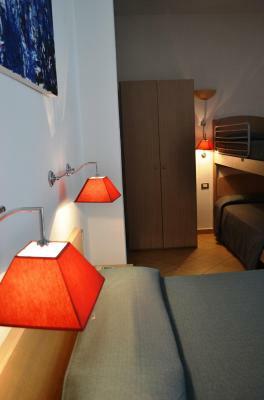 It is also very close to the city center and to the harbor where you can rent boats. The rooms were nice and clean. Overall a very good experience. We loved everything. Everyone was so helpful and the views are amazing. The location so close to the water is very attractive. 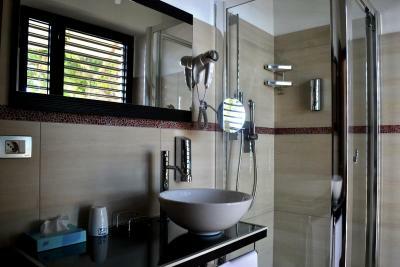 The fixtures, windows, etc are good quality. 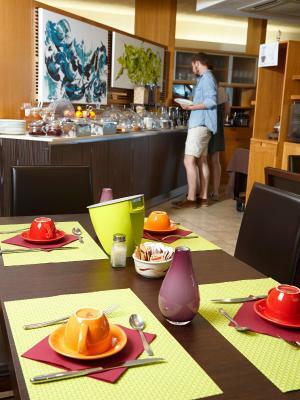 The breakfast offers a lot of choices, although we are happy with a brioche and cappuccino. Also, the management seems focused on energy and water efficiency and waste reduction. Should we return to Cala Gonone, We would stay at Cala Luna. 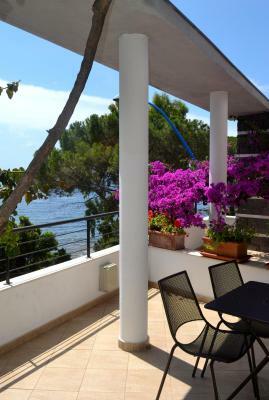 Great location in the centre of Cala Ganone, the perfect base to explore the stunning coastline and beaches! Sky bar was great, super friendly hosts, great location, good for couples. Nice breakfast with homebaked cakes - even glutenfree options! Very serviceminded staff. We were offered umbrella (no charge) when we walked out in the veneings and it was rainy. We could stay 4 extra hours on out-checking day without any extra charge; that gave us an extra visit to the beach in the morning hours! 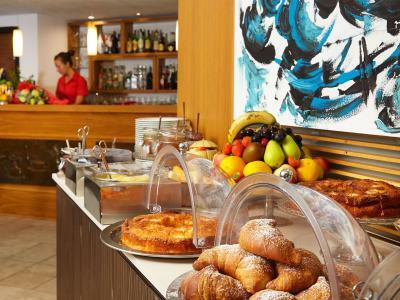 The staff were very good and the hotel clean with good breakfast. Evening meals were expensive and we were disturbed in the early morning by cleaning in the restaurant below. Street cleaning and most of all the collection and tipping of empty bottles. 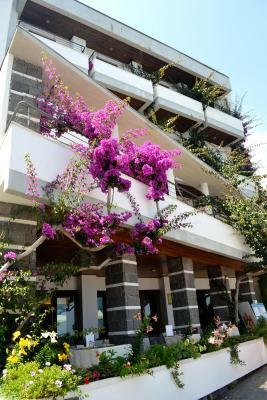 Hotel Cala Luna This rating is a reflection of how the property compares to the industry standard when it comes to price, facilities and services available. It's based on a self-evaluation by the property. Use this rating to help choose your stay! 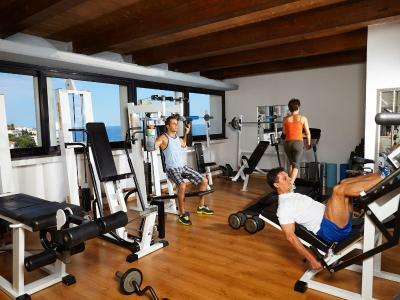 The beachfront Cala Luna is a hotel overlooking the Mediterranean Sea and set along Cala Gonone promenade. Family-run, this property features rooms with views of the coast and fine dining options. 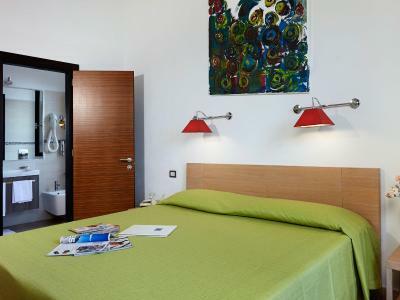 Fitted with modern furnishings, white-washed rooms at Cala Luna hotel are bright and airy. They all include a TV set with satellite channels, private bathrooms, while some open out onto private furnished balconies. Guests can choose among 3 eating venues. 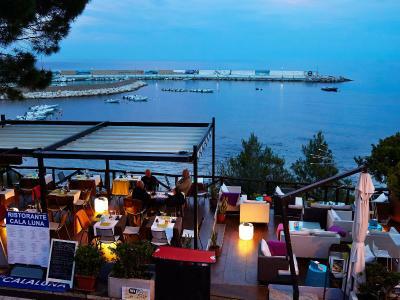 There is an air-conditioned indoor restaurant, an outdoor one, set in a secluded courtyard, and the romantic restaurant facing the bay, where candle light dinners are matched by seafood specialties. Massages, yoga lessons and bike rental are available on request. Free covered parking is available for motorcycles. 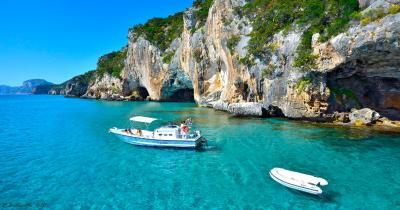 Staff at the Cala Luna can suggest visits and excursions, and organize boat cruises. The property is within walking distance of the local harbor with services to Cala Luna, Cala Mariolu, Cala Golorizé, Cala Sisine and Bue Marino caves. 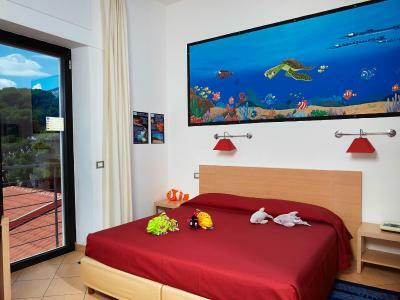 This is our guests' favorite part of Cala Gonone, according to independent reviews. 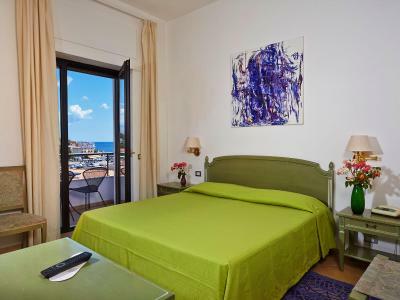 This property also has one of the top-rated locations in Cala Gonone! Guests are happier about it compared to other properties in the area. 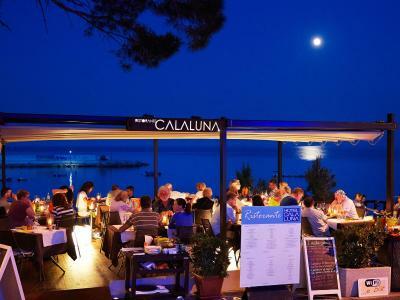 When would you like to stay at Hotel Cala Luna? 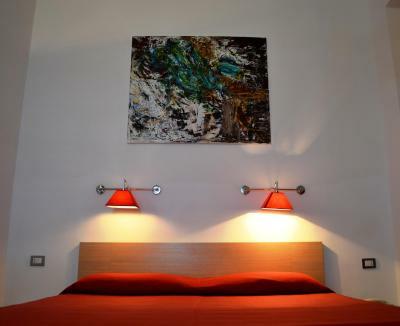 Air-conditioned room with satellite TV, a mini-bar and a private bathroom with a hairdryer. 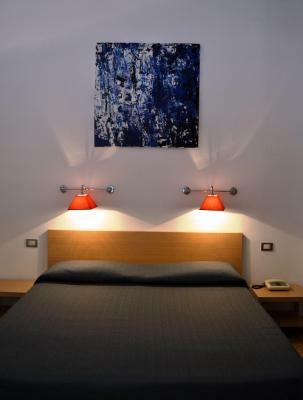 Air-conditioned room with satellite TV, a minibar and a private bathroom with a hairdryer. 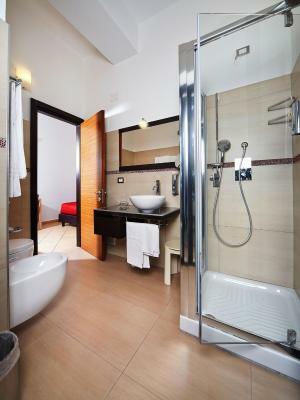 Air-conditioned room with satellite TV, free WiFi, a mini-bar and a private bathroom with a hairdryer. 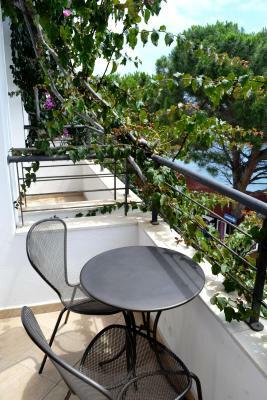 Featuring a balcony and free WiFi, this air-conditioned room has partial sea views, satellite TV, and a mini-bar. The private bathroom comes with a hairdryer. This air-conditioned room has Mediterranean Sea views from the balcony, satellite TV, a minibar and a private bathroom with a hairdryer. House Rules Hotel Cala Luna takes special requests – add in the next step! ATM card Hotel Cala Luna accepts these cards and reserves the right to temporarily hold an amount prior to arrival. Hotel Cala Luna accepts these cards and reserves the right to temporarily hold an amount prior to arrival. Please note the restaurant is open from 1 May until 31 October. Everything was great except the room could have been larger for 4 people - we booked rather last minute so I'm sure that had something to do with it. Great location, friendly and helpful staff. The family room was a little small but suited our needs and the bathroom was spacious. The sky bar with free snacks was excellent and offered great views over the port and ocean. The staff booked a wonderful and knowledgable guide for a hike into the canyon my family really enjoyed. No parking but the staff were very helpful and we were able to park in a side street by the hotel for no cost. The staff here are excellent. We like the green approach. No little plastic or cardboard packets or little soaps. The restaurant menu was very good and well presented. A very enjoyable stay. Great artwork everywhere. The room wasn't anything special. It was everything else that made it a great stay. It was quite a lot of noise from the street below (Comfort room without seaview). The walls in the room were not sound-isolated enough. Felt the restaurant was overpriced. The Sky Bar was out of action when it rained as the roof leaked badly which was a shame. The room was very noisey. Make sure you avoid a first floor room where you may as well be sleeping in the kitchen. Things go quiet at midnight so if you go to bed Kate you should be ok. The room was hot and required the air con in but this was like sleeping at the bottom of a waterfall. Very thin walls and could hear everything in the corridors, reception and downstairs. No soundproofing. Breakfast was very good and location in town was good. The staff were really friendly. The location exceeded my expectations. Lovely and lots of restaurants nearby walking distance. Lovely breakfast. Loved the sky bar. I will be back. The puma duo boat trip was excellent. The beaches were full of rocks and lacked any sand, but this is a minor price to pay for such a gem of a holiday location. The roof top bar was brilliant. The staff were really helpful and considerate. Room very hot, Aircon not working properly, big issue for me at 6 months pregnant, man at reception was bit confrontational about it when we complained but then lady he eventually sent to help was much nicer, she found a portable unit to cool room which made it bearable but was very loud and pumped out hot air from the back. At least they tried to fix problem, but for 170 euros a night they need to rethink their cooling strategy, location gets very hot. Bathroom also very hot. Really affected our last day of holidays. 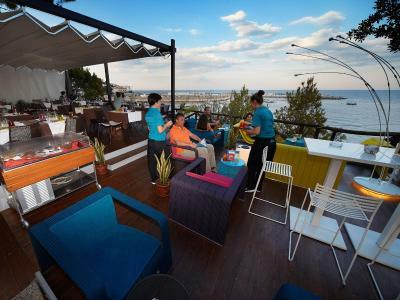 Good size room, large terrace, beachside location, fabulous restaurant, nice rooftop bar with nibbles. 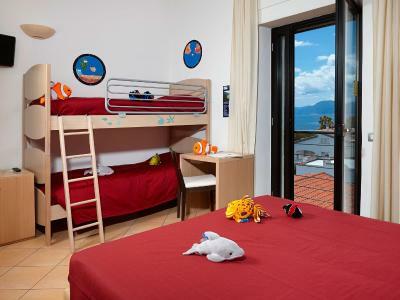 We were given a family room with a sea view on arrival which had a balcony from the bedroom and also from the bathroom. The views were superb! The bed was comfortable and the room spacious. This is a lovely town to have a sea holiday. Room very small, bathroom very tight. Hit head on bed light all the time. Parking a real problem! Dinner average - we went to another nearby, Mori 4, with excellent Sardinian food. location great, room was simple, view was great, aircon good. Breakfast was ok, excellent staff, probably one of the best rooms in one of the best hotels in the best location in Cala Genone, but small! Advise on boat tour - it’s a must!